- Balls for all competitions on the game. 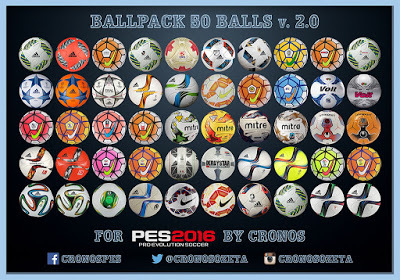 - Ballpack 50 Balls v.2.0 work correctly in any patch. - Hexaedited Names of Balls and Previews created by Cronos. - Added Adidas UCL Finale Milano 2016 on Champions League Friendly Match. - Adidas UCL Finale Milano 2016 on Champions League mode and Master League on playoffs and final match. - New balls for the 2016 season. · Copy the file CPK to the folder Download. · Edit your DpFileList.bin using this tool: DpFileList Generator v1.6. · Go to Edit mode and set them on the game for all competitions not licensed. - Credits Balls: Cronos, danyy77, ppaaggpp, SG.